Thank you for your interest in attending MUNUC. Registration will open on May 21, 2018 and remain open until September 22. Registration operates on a first-come, first-served basis. In the event that we reach capacity earlier than September 22, we will open a waitlist. Our admin team will confirm your delegation’s position assignments and number of allotted spots by early October. To begin, click the Register button in the top-right of the page. Reach us at admin@munuc.org with any questions. The pre-conference advisor handbook will also be a good resource leading up to conference. The school fee is non-refundable and is required to secure a registration. We will charge a flat rate late compliance fee for each delegate who has not submitted their completed forms or completed their waiver by Nov.2. Enrolled international schools will have to submit all school fees and 75% of delegate fees within 14 days of receiving their registration confirmation or they will lose their placement. This deposit is non-refundable. All conference events will be held at the Hyatt Regency Chicago. The venue is truly in the center of downtown Chicago, built on the Chicago River, facing the Magnificent Mile, and neighboring Millennium Park. With its modern amenities, the Hyatt Regency offers a contemporary and functional space to facilitate the stimulating discussions of a Model UN conference, and we are excited to bring MUNUC to the Hyatt this year. The hotel is in the heart of downtown Chicago, at 151 E Upper Wacker Dr, Chicago, IL 60601. It is conveniently situated near many dining options and attractions, and less than an hour from the city’s major airports at O’Hare and Midway. MUNUC has arranged for these special room rates at the Hyatt Regency, the conference hotel. We are requiring all delegations to stay at the Hyatt, unless by petition. Room requests will be made using the Hyatt registration link sent via email to all registered schools in mid-August. Please note “Room Type” refers to the number of individuals in each room. A Quadruple Room is 2 beds meant to sleep 4 people. The Hyatt is unable to place cots in rooms for extra sleeping space. Room rates are as follows, and do not include taxes. MUNUC believes that cost should not be a barrier to educational opportunity, and is pleased to offer need-based financial aid to schools and individual delegates. If the cost of attending MUNUC will be prohibitive for your delegation, we encourage you to fill out a financial aid estimate form, in order to get a better sense of how much assistance we would be able to provide. Your school does not need to register for MUNUC first to submit this form. 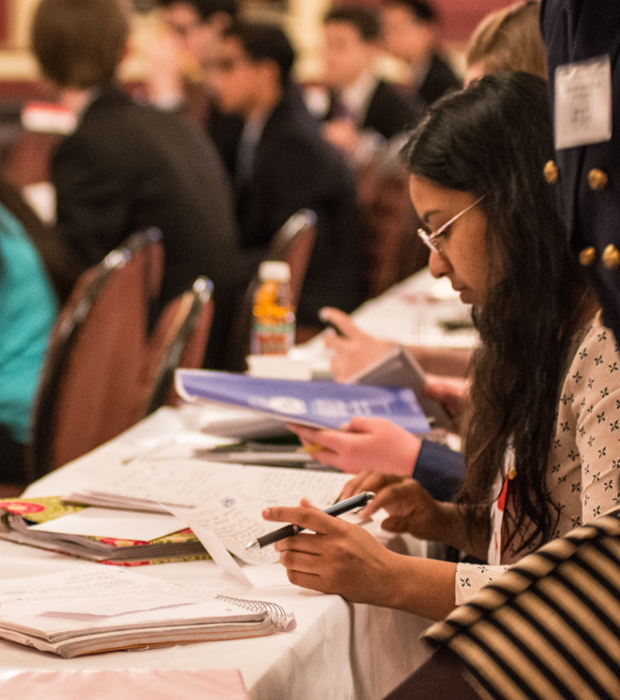 The expected costs of MUNUC include, but are not limited to, a school registration fee, individual delegate fees, travel arrangements, hotel expenses, and food for the weekend. We are able to offer financial aid in the form of school registration and/or individual delegate fee waivers, hotel vouchers, and travel reimbursements. Aid can be offered to entire delegations or to individual students. In the case of individual students, aid will be given to the school in the name of the student. There are two separate portions of to our financial aid process: an advisor information form, and a two-part delegate information form. Instructions can be found on both forms. Advisors should complete the school information form and distribute the delegate information forms to students applying for financial aid, who should then complete part 1 of the form. For students applying for financial aid without their school, both parts of the delegate information form are required, but you will not need to submit an advisor information form. In order to ensure that your financial aid decision gets back to you as soon as possible, please email completed documents to financialaid@munuc.org. Applications are due October 22, 2018, and financial aid decisions will be returned to schools by November 3. MUNUC will refund delegate fees in the case of cancellation up until December 14. Refunds are not applicable for deposit fees or the school registration fee.